Meet Abigail. She’s the warm one on the right. That’s me—the cold one—on the left. Abby has the most beautiful fleece and I want it. Though, I’ll let her keep it until Spring, of course. I met Abby and her BFFs on a visit to the beautiful Observatory Hill Farm just after Christmas. She is part of a flock of saucy Corriedales of all hues and colors, but there was something about her carmel-y locks and shy ways that caught my attention. Well, shy until the bucket o’ corn and oats came out. After that she was eating out of my hand. Literally. Here are some of Abby’s flock-mates running down the snowy hill for supper. 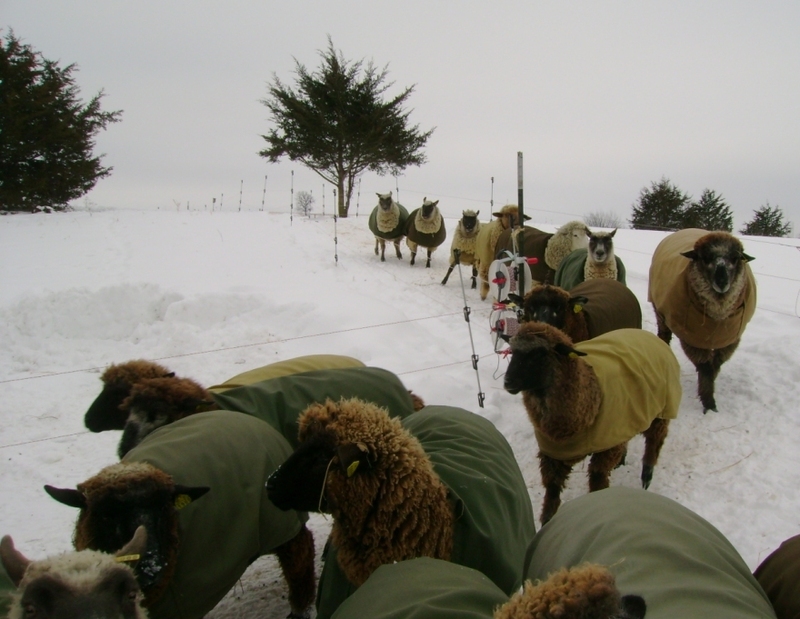 You’ll notice they are all in coats to protect the fleece from hay, burrs, poo and all that icky farm stuff. No, they don’t get too hot. Yes, there is an opening under the tail. 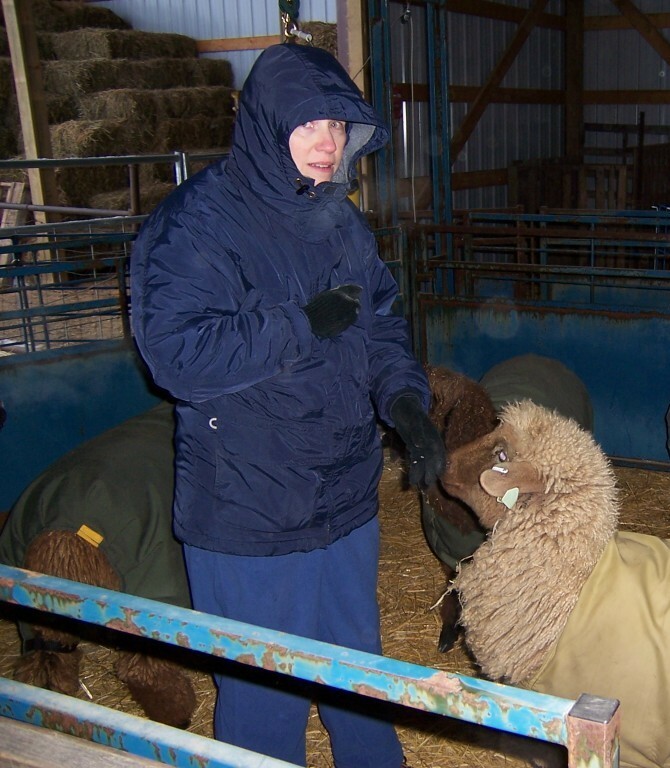 :-) I got the inside scoop on sheep coats from the shepherdess, who also happens to be my sister. And, yes, the coats come in different sizes. See Big Bella coming down just to the right of the lineup modeling her plus-size coat for the full-figured ewe? So, I’m trying to figure out what to do with my many bags of unspun Shetland so that I can justify getting my hands on Abby’s lovely fleece in the Spring. Some women have closets full of shoes. Some have bins full of yarn. And me? Yes sir, yes sir, three bags full…with seven or eight more in the basement. Entry filed under: Sheep to Yarn Process. Tags: Corriedale, raw fleece, sheep covers. This one was great fun and I rec’d it while in Kansas, so shared it with Tom.